MovieRob and Ryan of Ten Stars or Less have put their heads together and come up with a cracking blogathon for us movie buffs to tackle this August. Argumentative August is dedicated to 50 best courtroom dramas as voted by GamesRadar. For starters what is so fascinating about a courtroom drama? On paper it sounds kind of dull, reduced to boring legal jargon and insufferable lawyers desperate to make an impression. But inside these marble arenas of democracy the stakes couldn’t be higher. Tapping into such a relatable and personal experience film makers have produced some of the most memorable scenes in film history within the confines of democratic judgement. Turning tales of woe and despair into captivating stories without leaving a bitter after taste isn’t easy. We’re given a side to route for and more often than not we defend the accused right alongside the lawyer in that stuffy courtroom. Never before has this case been so clear cut as Sidney Lumet’s incorrigible 12 Angry Men. Based on the original 1954 teleplay by Reginald Rose, 12 Angry Men follows the intricate deliberations of 12 jurors as they weigh up the evidence held against the innocence of an 18 year old boy accused of murdering his father. Lumet’s masterpiece glides into the courtroom as the judge offers his two cents on the issue and dismisses the jury to come to a unanimous decision. With the weight of the world on their shoulders the jury sidle away into a private room and settle down for a preliminary vote. Requiring unanimity to determine the boy’s fate the vote comes out 11-1 in favour of a guilty verdict. The exception? Juror 8, Henry Fonda. Much to the annoyance of various other jurors, who have pre-figured a guilty verdict is obvious from the evidence put forward, they soon turn to Juror 8 to defend his reasoning. With the life of an 18 year old boy in their hands Fonda holds issues with the circumstantial evidence and earnestly elaborates that he’d at least like to talk about it first. Tempers fray, voices raise, and prejudices come out to play as Juror 8 figures the boy deserves a fair trial and attempts to convince the other jurors to change their preliminary verdict. Holding true to his initial intentions Fonda never unequivocally defends the boy’s innocence, but merely presents his arguments for reasonable doubt. When it’s clear that the other jurors are set in their ways Juror 8 reluctantly proposes a secret ballot to determine the jury’s decision. Lumet builds the tension beautifully until prejudices explode after a “not guilty” vote is drawn. In this sequence the jurors reveal pivotal character traits and tendencies that blossom to their full, terrifying potential over the course of the incisive 96 minute run time. At once shocking, captivating, and revealing Lumet instils a nervousness into each scene that finds little room for the characters to escape their deliberations. The crux of Juror 8’s reasonable doubt is realised when he reveals an identical switch knife to the one used by the murder suspect. Throwing the jury room into a tizz, it is at this moment that we begin to see the gradual shift in the jury’s state of mind. From an uncompromisingly certain verdict Juror 8 has worn the jury down until the multiple vote counts, taken over the course of the film, begin to show ‘not guilty’ as the favourable verdict. As the rest of the picture unfolds Lumet treats his viewers to a delight of complex personal issues, motivations, prejudice and macho tendencies to the beating drum of the stormy weather at arms reach just outside the window. Complementing the tense drama of the jury room Lumet masterfully utilises nature to symbolise the torrid torrent of clashing personalities unable to escape each other and confined to reasoning. 12 Angry Men is a compelling courtroom drama that tempts the viewer into their own conclusions on hidden character motives and inspires the reasonable doubt within us all. Henry Fonda is spellbinding with his passion for justice through thoughtful discourse and each of the jurors put in magnificent turns as both his sympathisers and antagonisers. In an often overlooked ironic twist Juror 12, a larger than life character in advertising, is the most impressionable juror of them all, changing his mind numerous times depending on arguments put forward. 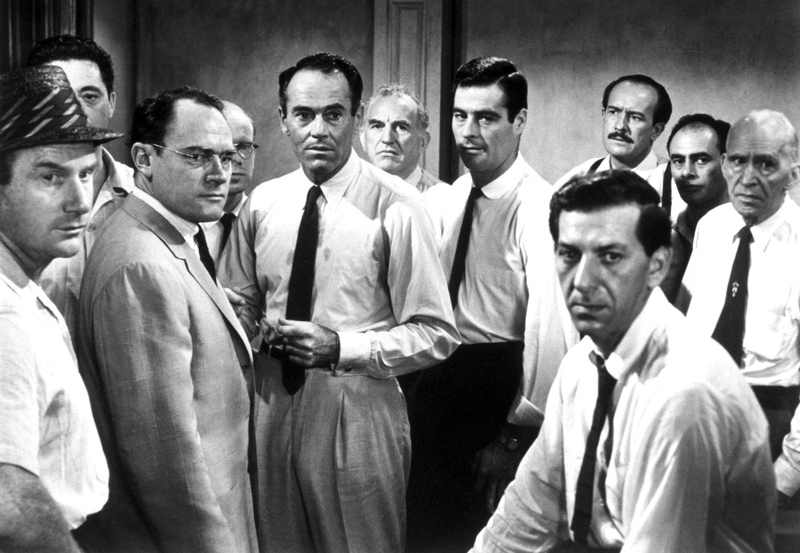 With intricate character development and magnificent dialogue 12 Angry Men will continue to inspire film makers and film critics alike with its seamless delivery. One of the all-time great films. Neat review dude.